On Nov. 1st, the expert in circuit protection— DA Technology reached the cooperation with AMEYA360. 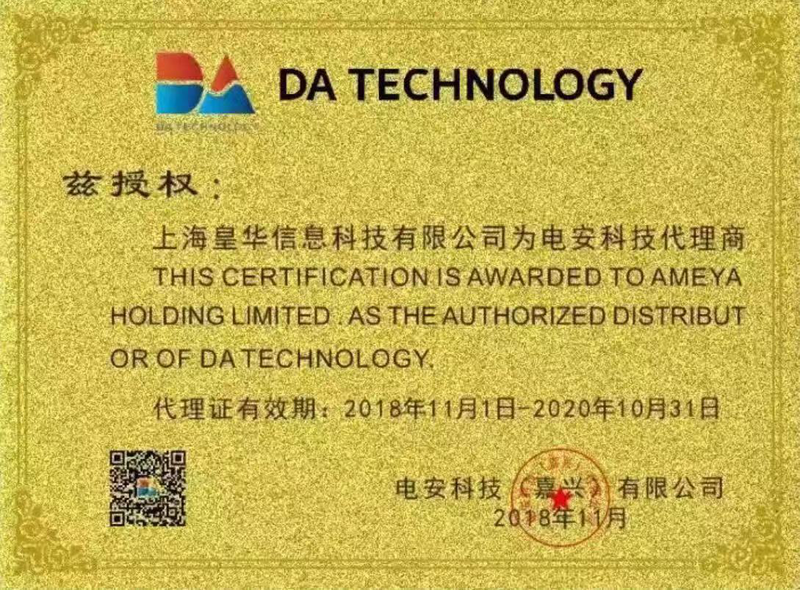 DA Technology is a Sino-foreign joint venture, an innovative technology enterprise based on new materials and new energy circuit protection. The products are widely used in electric vehicles, automotive electronics, renewable energy, cloud computing, drone, power supply, industrial equipment, LED lighting, and consumer electronics for the US, Europe and Asian markets. DA Technology originated from Silicon Valley in San Francisco where it has sales and R&D center. Its manufacturing facility, R&D and sales center are based in Jiaxing. In Shenzhen, DA Technology has its own sales team and sales office. DA Technology products include Thin Film Surface Mount Fuse,Square Surface Mount Fuse,Cartridge Fuse,Transient Voltage Suppressor(TVS),TVS Protection Array(TPA),Ceramic Chip Fuse etc.